Hearing about all the difficulties companies were having to produce professional ID cards, we decided that there should be a better solution. Emerging cloud-based technologies allowed us to take the hassle out of the process of creating Photo ID cards. The developments since have totally validated our belief that card production via the internet is far more efficient than traditional card production using either a local print-shop or in-house printing. At the core of our business is the desire to eliminate the hassle of producing a single ID card, which is common to businesses of all sizes. Online card personalization is our ONLY business. For eleven years now, we have been constantly striving to perfect the process. We are totally committed to offering a superior on-demand service to our customers. We have a single-minded focus on providing fast, efficient, low-cost id badge printing services. Our starting point was your biggest “pain-point”: how could we quickly and efficiently deliver to you a single card when a single new employee joins? Rather than focusing just on big batches, we designed our system to meet your needs on a day-in/day-out basis. We have produced hundreds of thousands of professional ID cards over the last eleven years. Our thousands of regular customers, from multi-billion dollar corporations to small local businesses, are able to flexibly, cost-effectively meet just about any ID card requirement. We are particularly well-versed in the use of advanced ID card technologies. We advise clients on how they can best use barcodes and magstripe technologies. But we also help them understand how RFID, smart cards, and 2D barcodes like QR Codes can help them achieve their organization’s objectives. We do not sell card printers or systems. So we will never try to sell you a printer system you don’t really need. We can conclusively demonstrate that, except for the largest corporate sites, the low, variable costs of an online service far outweigh the high up-front fixed costs of setting up and running an in-house system. We’ll even help you quantify the cost savings—just ask for us to send you a outsource-or-in-house financial model! We offer many options to help meet your specific requirements. We have APIs to allow integration with your website or back-office systems. 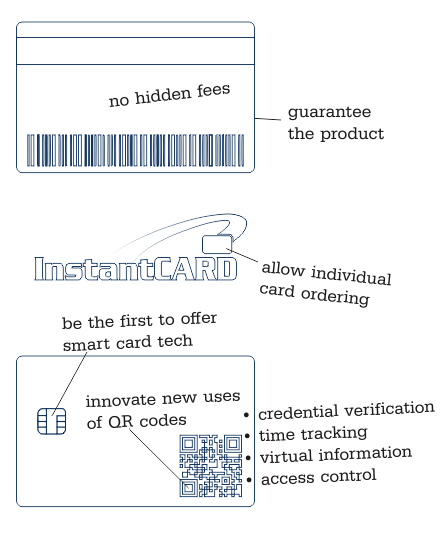 We can drop-ship cards and accessories to individual addresses. We can print cards which allow online credential verification. We can set up web pages with your logo, allowing your members or staff to order cards directly. Please call us to discuss your unique needs. 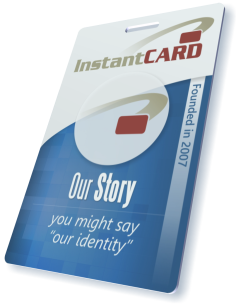 Together we can determine how we can adapt our service to meet your requirements, and help you decide if InstantCard is right for you. David loves all things tech, as well as travel, reading, skiing, and scuba diving. He spent most of his career in telecoms, in both Europe and the US. His favorite place in the world is Paris, although the home town of his Alma Mater, Stanford, is a close second. Yann enjoys exploring and discovering new fun things to do and see. You can find Yann playing underwater hockey at his local pool! (Ask him about it if you are curious!) Besides loving the sunny days and the outdoors, Yann tries to keep in touch with all the new technologies constantly coming out! Amanda’s first loves are her 3 cats with learning new design techniques and programs a close second. In her pastime she advocates for animal rights through social media and her design work. During the warm months she enjoys spending her time outdoors swimming, camping, and playing putt-putt. During the winter she stays inside praying for summer. To make Helio smile is easy but it takes the right amount of very strong coffee (as long as you don’t offer sugar to go with it). In addition to his love of coffee, Helio is an experienced Software Engineer with expertise in the entire Software Development Lifecycle. He is always interested in projects which aim to make the world a better place. When Monica isn’t at home watching documentaries on Netflix, you’ll most likely find her outside playing with the love of her life, Charlie the Maltese-Bichon. She loves listening to all different types of music and loves to dance the day (or night) away at different music festivals. Aymen characterizes himself, first and foremost, as a problem solver. He loves travel, studying history, and learning about cultures around the world. He focuses a lot on self-improvement, and in his spare time he likes to cook! Andrey enjoys training for powerlifting, reading, listening to music, and most importantly, spending time with his wife and daughter. Tianna has a love for metropolitan areas and all things construction! She completed her studies in Michigan and earned a B.S. in architecture and a M.S. in civil engineering. In her spare time she enjoys working out, reading and a casual stroll through a shopping mall. She also loves sports. Amado is passionate about entrepreneurship and writing software. He loves turning ideas into reality. When Amado isn’t working, he enjoys spending time with his family, eating all types of food, and dancing (bboying, popping, locking). When Libert is not in front of his laptop he is more likely to be listening to music or learning new stuff —from how to cook an Italian meal to how to train a dog. He also enjoys exploring different types of cultures’ food and languages. We believe you should be able to order cards in any quantity. Rather than focusing just on big batches, we designed our system to meet your needs on a day-in/day-out basis. So you can easily order a single card when a single new employee joins. We believe you deserve straight talk on the tech best suited to your needs. We believe your satisfaction should be 100% guaranteed. You are buying the finished product, not the process. The finished product should be perfect. Drop by. We’ll buy you coffee and show you around!